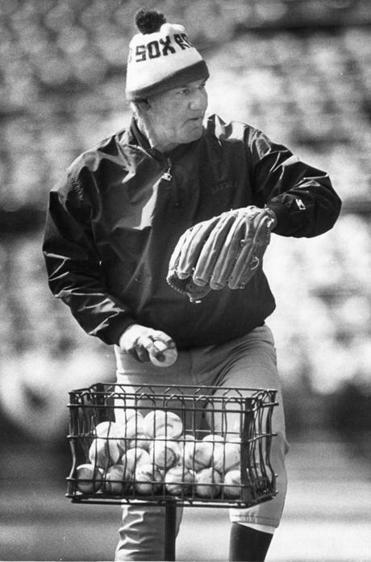 Mr. Fischer, shown before a game in Milwaukee in 1987, “had a rough and gruff exterior and you had to earn your stripes with him, but deep down he was a beautiful person and one of the greatest human beings I ever met,’’ former Red Sox pitcher Bruce Hurst said. Mr. Fischer had a 45-58 record and 4.34 earned run average as a pitcher with five major league teams. When the Red Sox hired John McNamara as manager in 1985, he asked his former pitching coach in Cincinnati, Bill Fischer, to join him. “On the fundamentals of pitching, he’s one of the best I’ve ever come across,” McNamara told the Globe a year later when the Red Sox were on their way to the American League pennant. Bruce Hurst, a pitching standout on that team, said he could still “picture Fish wearing an old catcher’s mitt and with a stogie in his mouth while we worked together” in the bullpen. “He had a rough and gruff exterior and you had to earn your stripes with him, but deep down he was a beautiful person and one of the greatest human beings I ever met,” Hurst added. Mr. Fischer, whose baseball career began in 1948 as a 17-year-old minor league pitcher, and who stayed in the game for the next seven decades, died of kidney failure Oct. 30 in Josie Harper hospice house in Omaha. He was 88 and lived in Council Bluffs, Iowa. A senior pitching adviser for the Kansas City Royals at the time of his death, Mr. Fischer holds the Major League Baseball record of pitching 84⅓ consecutive innings without giving up a walk, while he was with the Kansas City Athletics in 1962. Former Red Sox ace Roger Clemens said that he and Mr. Fischer had a father-son relationship. Mr. Fischer, who also had been a pitching coach for the Richmond Braves of the International League and the Tampa Bay Devil Rays, stressed the importance of first-pitch strikes. When Clemens, who had a cut on his pitching hand, was pulled by McNamara in Game 6 of the 1986 World Series after the seventh inning with the Red Sox leading, 3-2, a controversy arose because Clemens said he wanted to continue and McNamara said he did not. The Red Sox lost that “one strike away” game, also memorable because of Bill Buckner’s error, and then lost the Series. Mr. Fischer stayed on as pitching coach for manager Joe Morgan after McNamara was fired during the 1988 season. The Red Sox advanced to the postseason in 1988 and 1990, but Morgan and Mr. Fischer were let go after the 1991 season. “I leaned on Fish a lot and I always liked him and trusted him,” Morgan recalled. A son of William Constantine Fischer and the former Grace Chizek, William Charles Fischer graduated from Marathon High School in Wisconsin in 1948, when he was signed by the White Sox and sent to its Wisconsin Rapids Class D team. Over nine seasons encompassing 281 games — 78 as a starter — Mr. Fischer had a 45-58 record and 4.34 earned run average. He pitched for five major league teams and spent 10 years in the minors, retiring in 1968. Mr. Fischer served as a Marine drill sergeant in 1952 and 1953 and said it was “the only two-year contract I ever had in my life,” according to the Society for American Baseball Research. On May 22, 1963, in the 11th inning at the old Yankee Stadium, New York slugger Mickey Mantle turned on Mr. Fischer’s fastball and launched what Mantle called “the hardest hit ball of my career,” off the very top of the right field façade, nearly hitting it out of the park. Mantle wrote a note on a poster of that homer, humorously thanking Mr. Fischer for helping him get into the Hall of Fame. It was among Mr. Fischer’s many treasured mementos. But he also had impressive outings. In one three-game stretch in 1959 with the Washington Senators, he shut out the Yankees for 10 innings and recorded complete game victories over Boston and Detroit. When Mr. Fischer was about to enter hospice care, his stepdaughter, Melissa Nunley of Omaha, reached out to people in the baseball world. “Baseball was in his blood, his heart and his soul, and he told all the old friends who called what a positive effect they had on his life,” Melissa said. A celebration of Mr. Fischer’s life has been held, at which — by his request — Clemens, Nipper, former Royals and Atlanta Braves general manager John Schuerholz, and current Royals general manager Dayton Moore spoke. Mr. Fischer’s first marriage, to Joan Priebe, ended in divorce. He married Val Hager in 1984. In addition to Val and Melissa, Mr. Fischer leaves a son, Michael of Ocala, Fla., and two daughters, Patti Hamilton of Melbourne Beach, Fla., and Mary Jo Johnston of Bradenton, Fla., all from his first marriage; a stepson, Michael of Council Bluffs, Iowa; his brothers, Tom of West Bend, Wis., and Gary of Wausau, Wis; his sister, Rosemary Small of Seminole, Fla.; 10 grandchildren; and eight great-grandchildren.